Infiniti is set to unveil a redesigned QX50 at next week’s 2017 Los Angeles Auto Show, but the vehicle has been already spotted testing. 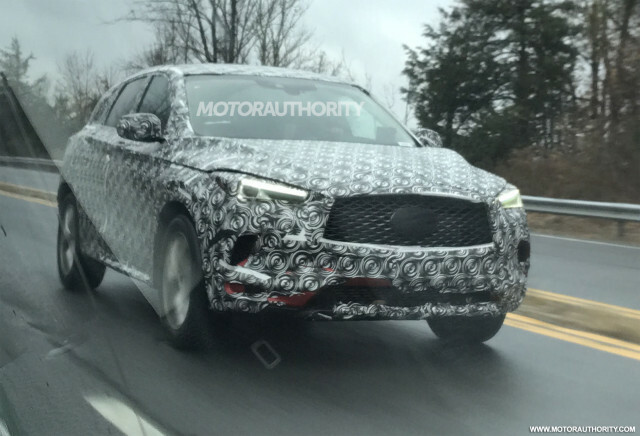 Thanks to the quick actions of eagle-eyed reader Collin Brown, we have revealing spy shots of a prototype for the new QX50 which goes on sale early next year, as a 2019 model. Unusually, Brown spotted the car testing in New York state’s Hudson Valley, far from the usual California and Death Valley locations for camouflaged pre-production vehicles. The design is hardly a surprise as Infiniti has already previewed the vehicle with a series of concepts, the most recent being the QX50 concept unveiled in January. The high-tech details and sleek lines contrast with the homely look of the current QX50 which traces its roots to the Infiniti EX first introduced for 2008. Infiniti calls the new look Powerful Elegance. Aside from the more alluring shape, what’s under the hood is much more interesting. The new QX50 will be the first vehicle powered by Infiniti’s variable compression engine, dubbed the VC-Turbo. The engine constantly changes the cylinder compression ratio for better performance or better fuel economy, depending on circumstance, and is said to result in the high performance of a gasoline engine with the torque and efficiency of a diesel. The VC-Turbo is a 2.0-liter turbocharged inline-4, which will deliver in the vicinity of 268 horsepower and 288 pound-feet of torque. Those numbers are substantially better than the 208 hp and 258 lb-ft from Infiniti’s current 2.0-liter turbocharged inline-4. It’s a good thing the new QX50 has a lot going for it. The vehicle won’t have an easy time in the small luxury SUV space. There are a lot of strong competitors here. The list includes the include the Acura RDX, Audi Q5, BMW X3, Jaguar F-Pace, Land Rover Discovery Sport, Lexus NX, Mercedes-Benz GLC and Volvo XC60. Production of the 2019 QX50 will take place at a new plant in Mexico. The plant is jointly owned by Infiniti parent company Nissan and German auto giant Daimler. Daimler will use the plant to build next-generation Mercedes-Benz compact cars. The L.A. Auto Show opens its doors on November 29. For more coverage, head to our dedicated hub.